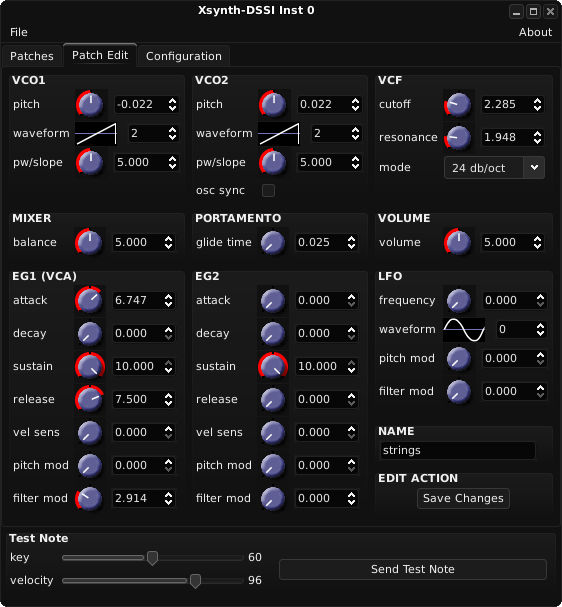 Xsynth is a realtime, mono/polyphonic virtual synthesizer (version 1.0.2 pictured above) developed by Sean Bolton, available in both 32-bit and 64-bit installations. Audio output is monophonic. When used with Ghostess as host, the Configuration page provides amount of polyphony, global pitch settings, pitch bend range and "on" (retrigger), "once" (legato) and "both" setting options when in monophonic mode. To open Xsynth in Ghostess, open a terminal and type ghostess xsynth-dssi.so. Xsynth can also be used as a plugin in hosts such as Carla and Qtractor. Xsynth has two oscillators, each one detuneable two octaves in either direction. The waves provided in this synth are: sine, triangle, saw-up, saw-down, square, PWM pulse and PWM triangle. There is pulsewidth adjustment for each sound source, and both oscillators can be synced together. The levels of the two ocillators can be balanced, and portamento control is also included. Xsynth includes a standard ADSR profile for amplitude, nominated EG1, and a secondary envelope nominated EG2. The filter and pitch controls of both EG1 and EG2 affect only oscillator 2. Both envelopes can be adjusted for velocity. The depth of pitch adjustment is up to one octave. 12db, 24db and MCVLPF3 filters are provided. The 24db filter is particularly strong so use caution when adjusting resonance. The MCVLPF3 filter can self-oscillate. The LFO section includes sine, triangle, saw-up, saw-down, square and pulse-modulation waveforms. Filter and pitch can be modulated by this LFO. The Modulation wheel is hardwired to filter envelope (contour) depth; aftertouch (pressure) is hardwired to resonance, for interesting tremolo control. Be careful when saving presets and banks, as there are no warning prompts when overwriting any previous files. NB: All Xsynth presets in dssi format can also be imported into WhySynth, although some parameters made need adjusting slightly in order to get an identical sound. XsynthBank1 -Bank 1. Right-click the link to download the file. XsynthBank3 -Bank 3. Right-click the link to download the file. XsynthBank2018 This bank has a few new presets not available in banks 1 and 3. It is my current rolling collection for use in dssi hosts such as Ghostess. Right-click the link to download the file. --Updated September 04, 2018. Xsynth-Carla Presets -My rolling collection of presets for Xsynth (currently 148) in .carxs format for use in Carla host. --Updated June 10, 2018. Xsynth-Mooglike Bank This is a start at my work using Xsynth's MCVLPF3 filter, exploring some Moog-like sounds. Try adjusting the Modulation Wheel control to get the filter depth desired. (Make sure that CC control is active when using hosted in Carla.) Most of these were made with monophonic use in mind, but a few work well as polyphonic instruments. This file is for use in dssi hosts such as Ghostess. Right-click the link to download the file. --Updated September 1, 2018. Xsynth-Carla Mooglike Presets Many of the above but in .carxs format for use in Carla host. --Updated July 30, 2018.